Today’s Dell announcement of their donation to the Apache Software Foundation is a huge milestone not only for Calxeda but the entire ARM server ecosystem. Supporting and engaging the open-source community has always been a high priority for the Round Rock based company, evidenced by their contributions and leadership in multiple open-source projects like OpenStack and other Apache projects. But this particular announcement is more than just a generous donation to a non-profit foundation. Dell announced today that they are working with TACC (Texas Advanced Computing Center) to provide access to ARM-based servers for developers and researchers. Here’s one of many articles: http://www.v3.co.uk/v3-uk/news/2180570/dell-targets-datacentres-arm-copper-servers . This is an important announcement, since Dell is a big player in the markets best suited for ARM such as Internet web properties, Big Data, Cloud Service Providers, and HPC outfits. As such, this further validates the market demand for ARM-based servers, and helps accelerate the growth of the required ecosystem. The observant reader will notice that Dell is using the Marvell Armada XP SOC, because, as Dell pointed out, “the Marvell parts are already available in sufficient quantities”. But Dell positioned themselves as “agnostic”, and confirmed in interviews that they are also working with Calxeda. As the ARM server market continues to take shape, the one constant you can expect is choice. Thats the beauty of the ARM business model! Congratulations Dell! Welcome to the party! Nice job, DELL. Ditto Intel! Now, you might think, “oh wow! 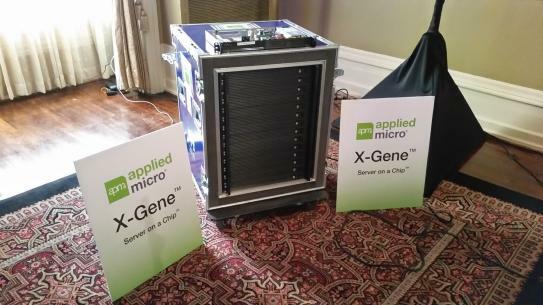 A 20 watt Intel Server! ARM’s lead certainly didn’t last long; Calxeda is toast! ” A sub-20 watt Xeon is indeed an accomplishment; Intel is a great company and knows what they are doing. But be careful when comparing our 3.8 (ok, call it 4) watt ECX-1000 to a Xeon. On the surface, we consume 1/5th the power. Not bad! But the story runs deeper than that. Let’s dissect the fruit and see what’s inside. Xeon is not an SoC (more on that in another blog). It is a multi-core processor, like the Cortex A9 from ARM. It does have some integrated I/O (PCI-E 3.0 to be precise). But it does not have Ethernet, much less five 10Gigabit Ethernet ports. It does not have SATA controllers. It does not have an integrated BMC for processor management, much less fabric management and power optimization. All of these need to be added as additional components in the system BOM cost and power envelope to offer equivalent and necessary functionality to a Calxeda ECX-1000. Xeon does have more performance per thread; probably 3-5X, in fact, depending on the workload. But remember that ARM processors for servers are NOT about performance. If you need performance, buy Intel, or AMD, or IBM Power. But, it doesn’t matter how fast your thread or core can run if you are spending 90% of your time waiting for I/O. And that is exactly the problem people have with traditional architectures today in dealing with data-intensive computing such as Hadoop. So, always be sure to check your fruit carefully!